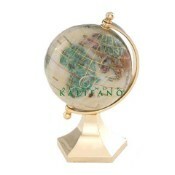 The Alexander Kalifano Contempo Mini Series is a collection of small 3" and 4" gemstone globes mounted on a contemporary arch stand. 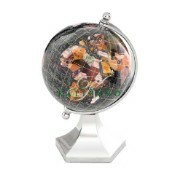 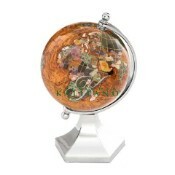 Handmade by skilled artisans, each gemstone globe contains embedded semi-precious gemstones. 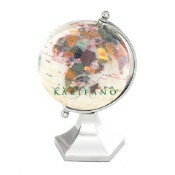 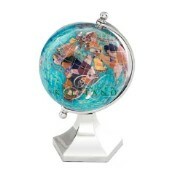 The gemstone globes are available in a wide number of luxurious colors. 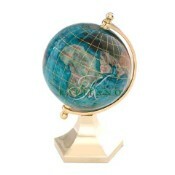 The stands are silver-plated or gold plated. These are excellent gift ideas for those who like a worldly accent to their home or office. 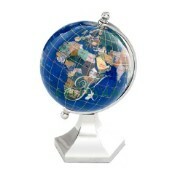 Contemporary life has its mini luxuries.